It’s my turn…but don’t remind him. Have a great weekend! I think your little monkey looks cute with his hair the way it is. Love the quilt. Awww, don't cut off too many of those sweet curls! What a happy, cheeky face. Love the quilt he is lying on. But his curls are so cute don't cut them. What a doll. Oooh, love the hanging selection to work from. Good luck with the haircut! 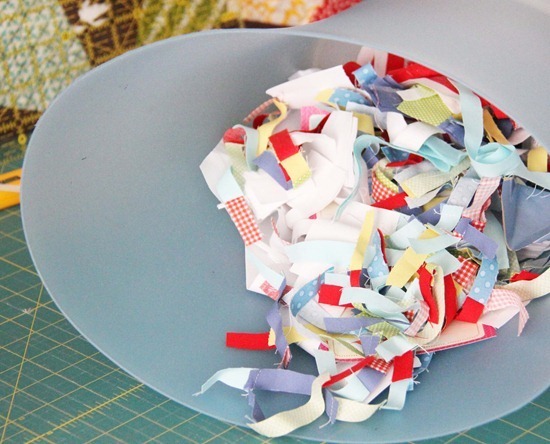 For all the bits in the trash can, have you considered sewing them up in an old pillow-case and donating it to the dog pound or humane society near you? I've filled a small bag, and am almost ready to stitch up a whole pillow case. The doggies and kitties would love it! Melissa that is an awesome idea, would you like to Email me and I will send you my scraps? I usually give them to other crafters and I don't have time to make animal beds, but I love the idea! Those curls are adorable. My son had curly hair as a toddler and after we cut his hair for the first time, they were gone. Now that he is older, he let his hair grow back a little and the curls re-appeared. So funny. Beautiful works in progress, and what a grin!!! Wow! Just look at all those quilts! That little guy is just picture perfect! I LOVE this quilt and please – leave the hair like it is, it looks so sweet! 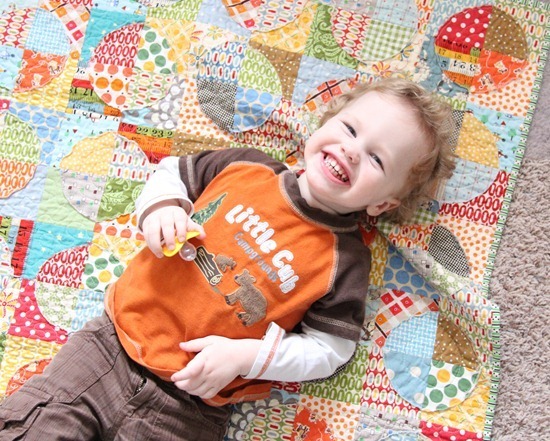 Pretty quilt & what a cute, cute lil' boy!!! I thought I was all alone in my strangeness, but I also enjoy the look of my garbage can after a session of block trimming! My son has curls like that and we usually bribe him with a promise of chocolate after his buzz… he like it, though, because it "tickles" but holding still is so hard at that age, thus the chocolate. Howdy! Love all the yummies! And what an adorable kid too! Along with Melissa's comment, if you don't want to make a bed yourself or if you don't have the time, my quilt shop in Colorado collects all the scrappies you cut off of fabric. This is even threads and batting. We have a group of gals that make doggie beds for humane societies in need! Let us know if you are ever interested in sending (or bringing) us your un-usable scrappies! Email me at katie@the-sewingcircle.com if you are interested! Awwww! Such a cutie! I love the WIPs on hangers. If my closet had any room in it, I'd borrow your idea! Your son is absolutely adorable. You can see his eyes mean monkey business! Your quilts are very sweet. I could not help but sniggle and grin when I saw your little one! Your little guy is so sweet! Looks like you have really been busy sewing! OOh, i Love the idea of taking turns cutting the kids hair. I always do it, but my husband is quite capable. It's his turn next!!! Wow! I love your work in progress quilts!! Such a happy picture! 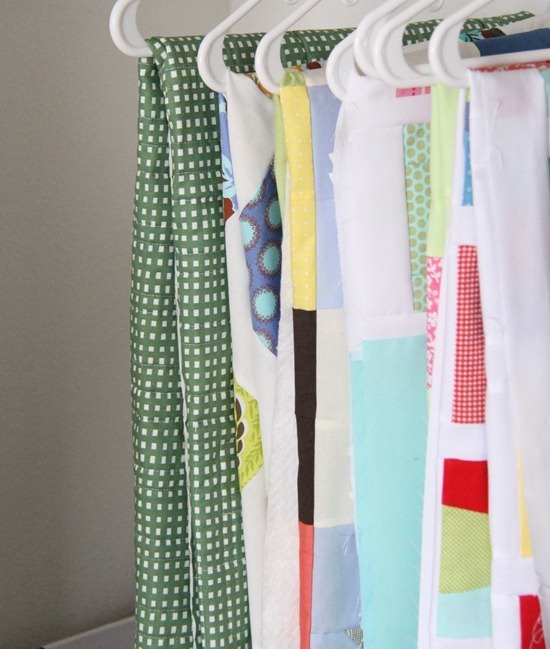 I love the idea to hang your unfinished quilts. love little tips like that.